There is a game people like to play that goes, "When would you most like to have lived and why?" The Italian Renaissance? Mozart's Vienna? Shakespeare's England? Personally, I would like to have been around Bach. But I have a real difficulty with the game, which is that living at any other period of history would have meant missing the Beatles, and I honestly don't think I could do that. Mozart and Bach and Shakespeare are always with us, but I grew up with the Beatles and I'm not sure what else has affected me as much as that. "He was a giant, a great, great soul, with all of the humanity, all of the wit and humor, all the wisdom, the spirituality, the common sense of a man and compassion for people. He inspired love and had the strength of a hundred men. He was like the sun, the flowers and the moon and we will miss him enormously. The world is a profoundly emptier place without him." 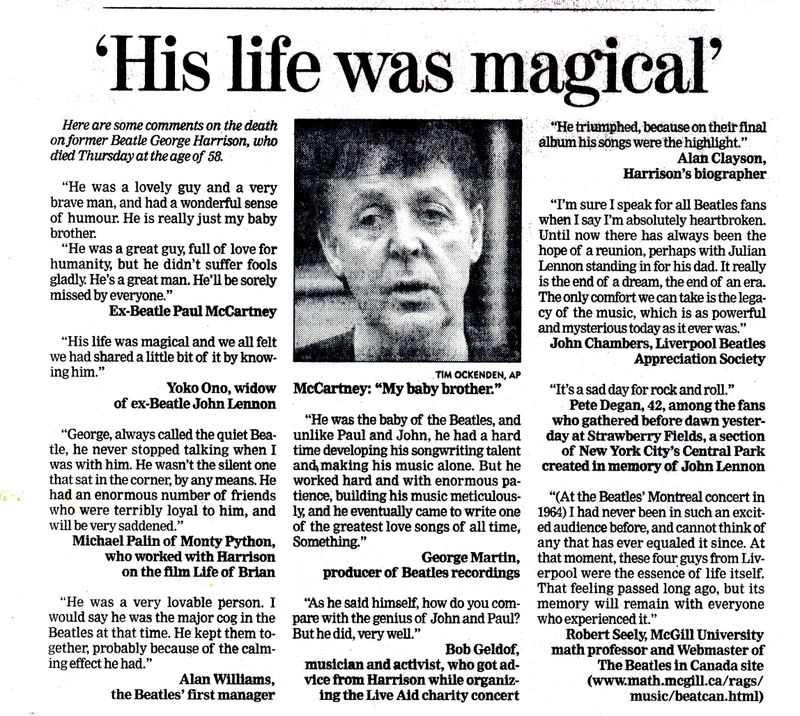 Check out Frederick Harrison's article 1963 in the US and Canada for his view of the very early days of pre-Beatlemania in Canada (contrasted with the experience in the US). 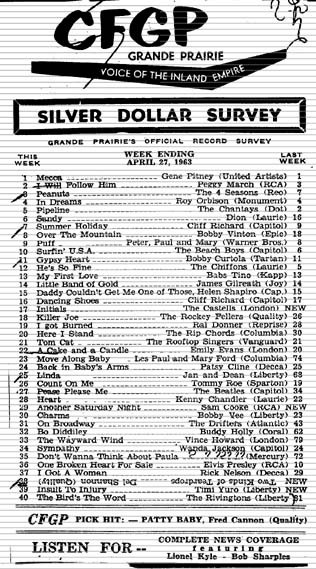 Also linked is a scan of an early hits chart with Please Please Me at number 27. More information at the Capitol of Canada "6000" series page. 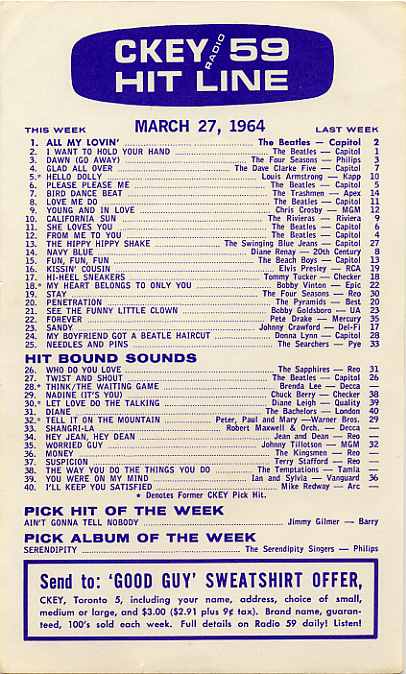 In addition (thanks to Andrew Croft for bringing this to my attention) here is an early CHUM chart from 2 December 1963 showing the first listing of She Loves You in the Toronto area. 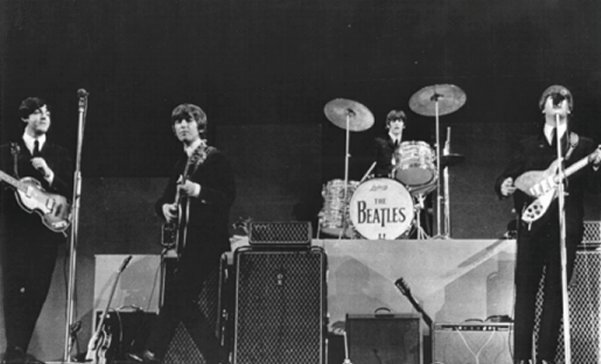 Here is a photo of the band taken at their concert in Montreal, Sept 8th, 1964. Click on it for an enlargement. There is a great wealth of information on the net about the Beatles discography insofar as it concerns the UK and the US. Other countries have generally been shortchanged1 in this regard, however, (with the possible exception of Germany and Japan). I would like to add the following short article covering the early Canadian discography, which was significantly different from either the UK or the US history. Capitol Canada was much faster than its American cousin to take up the opportunity offered by EMI, with the result that Canadians experienced Beatlemania sooner than those poor unfortunates who lived south of the border. Capitol Canada did however have the familiar unhappy habit of repackaging the UK albums (in two cases out of three), making the Canadian release history unique. Personally, I prefer the UK releases, even if I had to wait for the CD reissues before I became familiar with them, but like many of my generation, I do have a warm spot in my heart for those battered disks of vinyl with the "6000" series Capitol logo. At least one of the two "official compilations" (which is what I think the North American albums ought to be called) had a lovely cover: "Twist and Shout" bears one of the famous "jump" shots, the one used in the UK for the "Twist and Shout" EP, naturally enough. I have listed below what I can gather of the releases in Canada of "principal" Beatles material in 1963-64. I have not included re-releases, nor pseudo-compilations like the "The Beatles vs The Four Seasons", the Tony Sheridan sessions, or the pseudo-documentary "The Beatles Story" -- in any event I believe the Canadian history essentially follows the US release history as far as those go. Furthermore, I have stopped this list at 1964, since thereafter Canadian releases are generally the same as the US ones. (There are some exceptions, since Capitol Canada has always been a separate company -- even today, EMI Canada is distinct, and releases in Canada bear its logo. The main differences in US and Canadian recent issues: for Paul's "All the Best" we got the UK version, not the US one, and we did not get as many typos in our release of "Live at the BBC" :-}.) The following information is based on several sources (including my own old collection of vinyl). Two particular debts are to a posting on rec.music.misc by Bob Pietkivitch , and a posting on rec.music.beatles by Gary Flinn . I have not been able to check all of the information in the RMM article; any corrections or additions (or suggestions for improvement) will be most welcome. PostScript: Some errors and additions have been pointed out to me by Gilles Valiquette; I have made the corresponding changes, with thanks for the help. Some other dates come from Tim Brent and Andrew Croft. Thanks to them all. Further improvements are still welcome. I have added the "official" release dates, as given by EMI Canada. These, and other information on the Canadian experience, may be found at the Capitol 6000 site. Any other claimed dates are given in brackets - you can be the judge! Thanks to Piers Hemmingsen for these updates. Contents identical to the British WITH THE BEATLES LP. Bother Me; Little Child; Till There Was You; Please Mister Postman. Me; I Wanna Be Your Man; Devil in Her Heart; Not a Second Time; Money. A raucous, big beat sound  ... good clean fun ... "Beatlemania"
A Taste Of Honey; There's A Place; Twist And Shout; She Loves You. Jun     A Hard Day's Night (LP - United Artists). Jul     "A Hard Day's Night"/"I Should Have Known Better" (45). "I'll Cry Instead"/"I'm Happy Just To Dance With You" (45). "And I Love Her"/"If I Fell" (45). There are four unique to Mexico Lps issued in early 1964 by Capitol of Mexico. Tim Brent posted this notice on rec.music.beatles - for a more complete listing of Mexican (and many other countries) Beatles releases, I recommend a visit to The Internet Beatles Album or "Frank's meagre Beatles page".